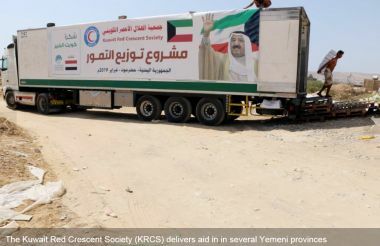 KUWAIT) -- The Kuwait Red Crescent Society (KRCS) on Thursday handed out humanitarian aid to 41,000 people in several Yemeni provinces. Carried by five trucks, 100 tons of foodstuff and dates have been distributed among 41,000 poor and needy families, KRCS Director-General Abdulrahman Al-Oun said in a statement to KUNA. This fresh gesture is part of the Kuwaiti charity's humanitarian program aiming at reaching out to the needy in all Yemeni provinces, he said. The KRCS is carrying out relief, sanitary, medical and development projects in most of Yemeni territories, in cooperation with other humanitarian organizations, Al-Oun added. However, he urged an immediate move to contribute to the alleviation of the sufferings and woes of the Yemeni people.